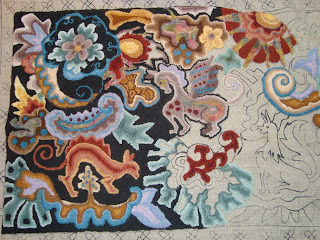 I've been working quite intently on my rug hooking. 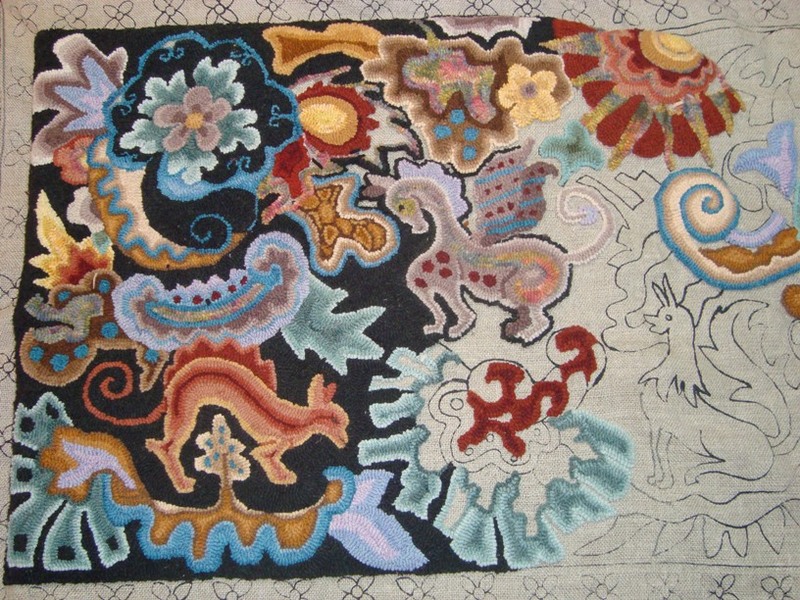 Here's my rug, Chimera, which I would like to get finished--at least the center--before my class in Lancaster breaks up for the summer. I'm starting to run out of some of my colors, and since I didn't dye the wool myself, I need to be able to determine what I do need before June, and let my teacher know so she can dye some more swatches.. Otherwise, any work on the rug will come to a halt in about six weeks. It's possible, of course, that I'll get very little done during the summer, as I discovered last year during my return to East Coast heat and humidity, that having a heavy wool rug on my lap isn't exactly what I enjoy doing during the summer months. I'd still like to keep my options open. Coming up- a review of "From the Land of Green Ghosts."